In your home, right now, you have electrical outlets which power your appliances with 120 volts AC (alternating current) electricity. For certain high-powered units (such as an electric water heater, electric range/oven, electric forced air heating/ cooling system, electric clothes dryer, etc.) 240 volts is supplied. But most appliances you use operate on 120 volts AC. You cannot store this electricity. So you receive this kind of power from your power company’s power plant. If there is any interruption in that connection (i.e. a tree falls on the power lines) or if the power plant stops operating, you lose your power. An Inverter to use the power. Lets take a quick look at those three things. We start with any device that generates electricity. This could be solar panels, wind turbine(s), a micro- hydro generator, or if necessary a fuel powered generator (diesel, gasoline, or propane). Ideally, the solar, wind, hydro, and similar devices will be our primary source of power because they do not consume anything that must be purchased. The fuel powered generator is simply a backup for when the sun, wind, or creek is not cooperating sufficiently. Now that we are generating electricity, we need to store it for use in the future. Why? Some times of the day you will be generating more power than you are using at that moment. Other times, you will be using more than you are generating at that moment. An example...take a large array of solar panels. In the middle of a bright sunny day, you will probably be producing more electricity than you are using at that moment. But come back several hours later when the sun has set, and how much power are you producing? Nothing! Wouldn’t it have been a good idea to store all that extra electricity during the day (power you were not even using) so you could have some lights that evening and run the computer or run a load of clothes in the washing machine? Of course. Well, that is what your batteries do. This is why they are so important. And remember, not every day is a sunny day. 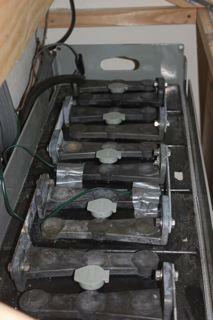 Your batteries will need to carry you through the cloudy days (if you are using solar panels). Learn more about my recommendations for batteries here. Now we have our batteries all charged up; but they are full of DC electricity and most of our appliances run on AC electricity. That is where an inverter comes in. It inverts the DC power from our batteries into regular household AC electricity that is now usable. Technically, it is possible to operate only DC appliances powered straight from the batteries and avoid even needing an inverter. But this is not an option for most people, as there are comparably very few DC appliances and they are often much more expensive than their AC counterparts. So almost everyone is going to want/need an inverter. That’s It! - Well, almost. These are the building blocks of renewable energy, distilled into their most basic parts! Not too difficult, right? Yes, there are other issues and components we need to look at, but once you understand the basic theory presented above, the rest is pretty much just details.